The days of launching an ad campaign with just TV or radio spots and print advertising have gone the way of the rotary dial telephone. With the plethora of handheld electronic devices available today, smart marketers know they need to take advantage of every moment consumers’ eyes are on these screens. And consumers are using them for more than talking and texting. 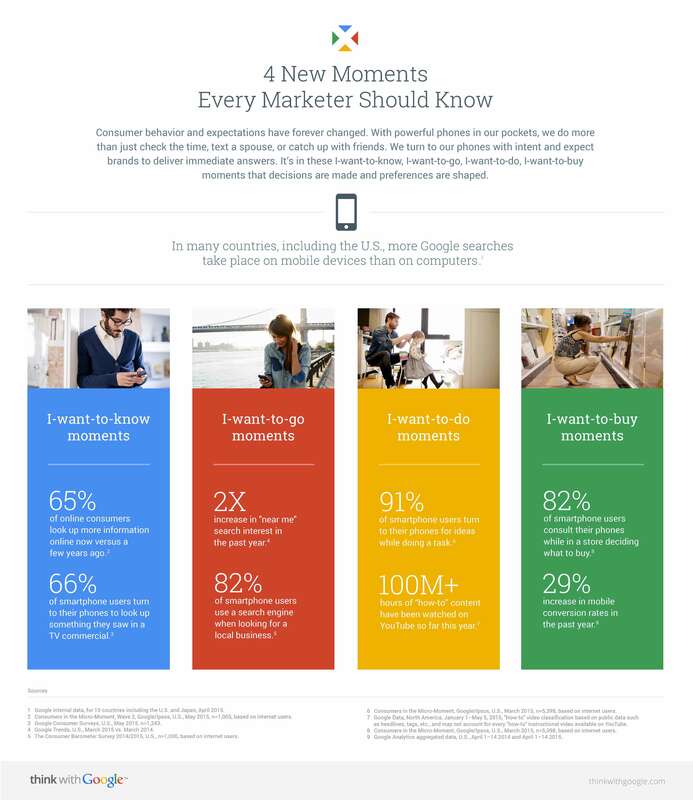 Google has explored what they call “micromoments.” Their research identified four key micromoments marketers should heed. Their research showed that people evaluate purchase decisions in-the-moment, with 82% of consumers using their smartphone to influence a decision in a store. People solve unexpected problems in the moment, with 62% of smartphone users more likely to take action right away. People pursue big goals in small moments. Ninety percent of smartphone users go to their phone to make progress on long-term goals, such as planning for a new home or looking for a new job. People try new things in routine moments with 91% of smartphone users turning to their phone while doing a task, such as calling ahead to make a table reservation while waiting in line at the grocery store. Make a moments map. Look at the customer journey to determine when people want inspiration, want information on your product, or when they’re ready to buy. Understand customer needs-in-the-moment. Put yourself in the customer’s shoes and ask how you can make things easier and faster. Use content to deliver the right experience. Use cues, like time of day, to deliver messages that feel tailor-made for the moment. Optimize the journey. People move seamlessly across channels and screens so make sure your messages are as consistent and seamless. Measure every moment that matters. Use metrics, even if you have to estimate, to determine the return on your messages in the moment. Can you identify some key micromoments when your customers might be ready to hear your message?